One of the first things people are curious about when first meeting Theresa Lovelace is her name. They ask her if she is related to the famous Linda Lovelace. Theresa explains that no she is not but her mother's name was in fact Lynda Lovelace who was a strong minded, classy, straight shooter of a woman. At the age of 42 Lynda was diagnosed with cancer and was told she had 6 months to live. Theresa was 18 and her relationship with her mother changed quickly after her mother became ill. Suddenly there was a very different bond and a desire to cram a whole life time of advice and guidance into a few short months. Lynda was determined to leave her daughter with the idea that life was like a good book, that Theresa would be the only author and editor of what her life story would be like, to take control and responsibility for what her book would be, and at all costs make it a good read. Theresa explains to people today that in a very short period of time her mother's illness and frame of mind impacted her life and left her with an enormous value for her family and mission to keep them close. Today Theresa is married and raising two daughters in Muskoka Ontario, Canada. Theresa is now in her 40's and hearing her mother's words loud and clear. A new chapter in Theresa's life story had begun when she confidently told her husband she wanted a to buy a motorcycle, and a few weeks later she had a learners permit, her first bike, a 250cc Suzuki Marauder and the huge challenge ahead of her in learning to ride it. Theresa admits she didn't realize the skill of riding a motorcycle was going to be as big of a learning process as it was. After scaring the day lights out of the poor couple she purchased the bike from as well as her husband and close friends she struggled with the desire to conquer the goal set before her and the thoughts of "this is crazy, I'm going to kill myself and I have two kids to think about. " It most definitely took some time, practicing in empty parking lots doing slow gentle clockwise circles too fearful to take on the added challenge of simply going the other way. And a couple of upsetting days after stalling and dumping her new precious toy at the bottom of the driveway. In time Theresa's confidence grew to the point that her husband decided this mission his wife was on wasn't going to simply pass and it was time for him to get his own bike and join her. An easy feat for him since he had ridden for many years in his youth. Theresa's next challenge ahead was in what to wear when riding her motorcycle. While she had equipped herself with a jacket that would keep her somewhat protected on her bike, she wasn't happy with its lack of style. In her quest to find her ideal jacket, Theresa was surprised to find that there really aren't many options for women wanting to look great while hitting the road on their bikes. That's when theresalovelace.com was born. Theresa's belief is that all women deserve to look great and thus feel great no matter what they are doing. 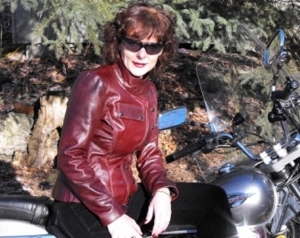 Therefore, she set out to find an expert in the craft of leather to help her create a line of women's bike jackets and accessories that would be equally stylish out for a day of shopping as they would be out on the road for a ride. The initial styles that have been produced are spectacular, providing both the style and protection that all female riders are looking for. All Theresa Lovelace jackets are carefully hand made in Canada by her team of extremely talented leather experts and designers. All Theresa Lovelace jackets are named after women that have crossed paths with Theresa for a brief period and left a memorable impact on her life. In this small way Theresa honours her relationship she had with her mother in recognizing the powerful ways one woman can influence our lives in a very short amount of time. After her first bike riding season Theresa has put a descent amount of miles on her bike and now jokes with friends that she can ride with the big dogs and gives a victorious howl. Check out Theresa Lovelace Designs to learn more about Theresa Lovelace and to view the first of the Theresa Lovelace line of bike wear for women.